A big and fast TN monitor. 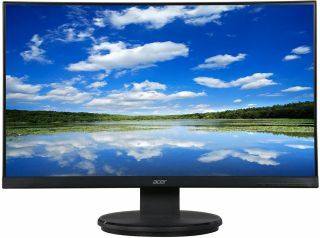 If you're in the market for a large monitor with a fast refresh rate, Newegg has a decent deal going for Acer's K272HUL monitor. It's currently on sale for $220, which is not fantastic, but a $20 mail-in-rebate and $10 off promo code (EMCRCCE23) knocks the price down $190. To be clear, this is for the TN model. Acer made things more confusing than they needed to be by listing several K272HUL models with different specs. The one that is on sale here (K272HUL ebmidpx) has a native resolution of 2560x1440 at 60Hz, along with a 1ms response time, 350 nits brightness, and 100,000,000 dynamic contrast ratio. Connectivity options include Dual-Link DVI, HDMI, and DisplayPort 1.2. The monitor also boasts a pair of 2W built-in speakers and a stand that supports tilt adjustments from -5 to 25 degrees. It's not the highest end monitor out there, but for the money, it's a relatively affordable way to go with a big and fast option, if that's what you're looking for.